A Leigh Griffiths goal after 36 minutes was enough to take the Hoops 11 points clear of second-placed Rangers in the Ladbrokes Premiership with two games in hand. 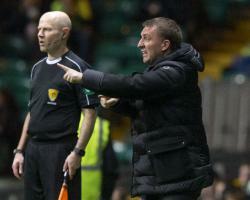 The victory also extended Rodgers' unbeaten domestic run since he took over the Glasgow club to 19 games which is a record for a new Hoops boss, one better than fellow Northern Irishman Martin O'Neill. However, it was a far from sparkling performance from the champions albeit against a side who had the 8-1 defeat at Celtic Park in January at the back of their mind. Rodgers said: "We want to all play beautiful football, fast flowing football and score goals but you don't always do that and when you aren't, can you still win? "And I think it shows the mark of the team that you can still get through that and get the end result. "Most of this season we have performed at a really high level and in some games we haven't and last night was one of those games where we didn't quite hit the heights, which is sometimes understandable with the number of games that we are playing but we showed a great desire and persistence to keep going. "Hamilton have lost a lot of goals here in the past so they were never going to open up, they were well organised, so we had to be really patient in the game and it was a good victory for us." Accies boss Martin Canning praised his side's fighting spirit. It would have been nice to get something from it but to perform that way, the boys deserve credit for their efforts."